OMEGA’s DPGM409 digital differential pressure gauge incorporates a rugged 316 SS enclosure designed for washdown and marine applications with a precision 0.08% accuracy pressure transducer and 316L SS wetted parts and body. 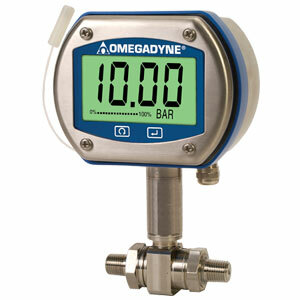 The result is an extremely durable digital pressure gauge. You get all the durability and stability of the micromachined silicon sensor in a rugged NEMA 4X (IP65) package. Notes: 1. Bidirectional ranges have a unidirectional analog output equal to their full span; i.e. -15 to +15 psi = 0 to 10 Vdc. Sensor: 72 to 89 mm L (2.8 to 3.5") below display, 80 mm (3.1") wide"
注: Comes complete with operator’s manual, battery (2 with wireless option), downloadable set-up and configuration software, USB cable (with wireless option) charting and databasing software with common drivers, USB cable, 2.7 m (8.9') analog output cable with ferrite core and 5-point NIST traceable calibration certificate. To order wireless option add suffix “-W” to model number for additional cost.